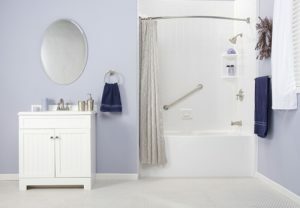 If you want to upgrade an old and outdated bathroom but don’t want to deal with the expense and hassle of completely tearing out and replacing your tub or shower, a bathtub liner from Compozit Home Systems might be exactly what you are looking for. We offer acrylic bathtub liners from Nu-Bath that fit over your existing tub or shower and can be installed in as little as a single day, providing you with a fast and economical upgrade option. More than 140,000 homeowners throughout the Louisville, Kentucky, area have trusted Compozit Home Systems for their home remodeling needs since we first opened our doors in 1982, and we are proud that the high level of customer service we offer has allowed us to maintain an A+ rating with the Better Business Bureau for many years. Why Choose a Bathtub Liner? Additionally, Compozit Home Systems offers convenient financing plans to help make your bathroom remodel project even more affordable. Contact Compozit Home Systems today to learn more about the attractive and durable bathtub liners we offer to homeowners throughout the Louisville, KY, area.